Since you are an awesome parent, I guess you try to spend as much time as possible with your kids and their friends, right? Birthday parties, sleepovers, play dates; you do them all. In that case, I'm sure you're familiar how frustrated kids get when they are bored – and how easily things start to bore them. When that happens, it’s time to bring out the big guns. Charades offer an excellent distraction, and it is something you can enjoy as well. Adapting the game for kids of various ages is easy, just keep in mind that they won’t insist on the rules as much as you might. That’s perfectly ok; the purpose here is to keep them entertained and sociable. Use Our Online Charades Ideas Generator! Everyone enjoys a good game of charades! What Are Charades? And How To Play? Even though we are quite sure that most of you are familiar with the concept of charades – chances are you played it yourself as a kid, and we are sure some of you enjoy a good game of charades even now – it bears repeating for those unfortunate parents that are unfamiliar with this magical way of entertaining kids. Charades is a guessing game whose object is to successfully communicate a word or a phrase to the rest of your team by acting it out. Speaking and mouthing stuff is not allowed. Here is how it works. Players divide into teams and one person from the team has to act out a word or a phrase to the rest of their team. They have a limited amount of time to do so, however, and a certain level of prowess is needed to be a charades champ. The opposing team members usually know the phrase that’s being acted out – it helps to keep things fair – but there are modified versions of the game where only the person acting it out knows it. This enables all players to have a go and cuts down on the wait. If you are playing with kids we recommend the later version; sometimes it’s simply impossible to explain a three-year-old that it is not their turn! Keeping score is simple. If your team guessed the phrase, you get a point. The phrases are usually picked from categories familiar to all those participating. Movies, celebrities, songs, actions, and books are all allowed, but when playing with kids you will want to limit the categories to those you know will be familiar to them. In the past, the players would write down phrases on a piece of paper and then pull them out of a hat. Today, you don’t have to bother. Simply open up an online phrase generator, and you will have access to a bunch of charades ideas for kids! Generate Some Charades Ideas for Kids! If you are playing with children, consider the best ways you can adapt the game to them so they find it a worthwhile occupation and, what’s more important, fun. Playing with children under three years old is somewhat challenging; not all toddlers can understand the concept and you will have to really put in an effort for them to participate in a meaningful way. This is not to say that it is impossible. Some three-year-olds will be able to grasp the essence of the game if you keep the phrases limited to their favorite toys, cartoons, and TV shows. Most kids this age will get more of a kick out of trying to guess a phrase than acting it out, so be prepared to work hard at keeping the game going and keeping it fun for them. Slightly older kids will be prepared to participate more actively. You will have to give them some leeway, however. Allowing for more time and letting them hint at the phrase if their team members are not the best at guessing works like a charm in preventing fits of rage and frustrated tantrums. Also, playing the ‘free for all’ style of the game is best suited for kids of all ages. They can divide into teams but if everyone gets a go you will cut down on moaning – he already went, it’s not her turn, you’re not on OUR team, that sort of moaning – significantly; plus, it’s more fun for everyone involved. Print this list or use our online charades generator. 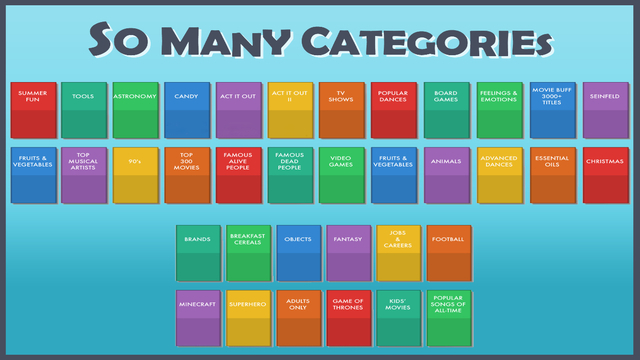 You can expand on the categories by adding in TV shows as well. These work better for slightly older kids, ones that graduated from cartoons to educational kids’ shows. We all love to gather as a family and watch movies together. Here are some childrens movies you can use for your next game of charades. Often the kids are better at acting these out than their adult opposition! Acting out videos of popular songs can be a lot of fun for certain kids, especially if they are musically inclined. If this is one of their predominating interests then by all means, include popular songs as a category. Just make sure that everyone playing is likely to know you top 10 picks! Again, expand the list with anything that is currently popular, and the kids are listening to. This is a category for kids in school – or those ‘brainiacs’ that are reading at the ripe age of five! This one can be tricky, however; not all kids read the same stuff and not all kids read, period. Use it when you are confident that everyone participating in the game has the habit of curling up with a good book. As a side note, we wholeheartedly recommend you get your kids hooked on books by Terry Pratchett! They’ll thank you for it for the rest of their lives! Charades are a great way for kids to learn and develop. Since kids learn best if we add an element of fun into the whole process, it is safe to say that charades will help them develop their communication and socialization skills. If you insist on adhering to the rules – and are good at getting kids to follow your example – then this is a great opportunity to teach them discipline. Older kids are better at this, however, save yourself the time and the frustration and don’t try it on three-year-olds. One of the most important benefits of charades is that it teaches children teamwork. They get to experience how quickly problems get solved if they cooperate and pull together. A game of charades is character building and a great way to teach kids how things work – or should work – in the world of grownups. You can download the ideas listed above in PDF format by clicking the links below. You can print them and cut them up to use for a physical game. If you'd prefer to go green, head to the next section! Or, use our online kids charades ideas generator! If you would prefer to go green and use an online tool to come up with ideas to play charades with your kids, then use a generator like this one. It contains all of the ideas above, plus 100s more. One other useful feature is it reveals how many words are in each idea, ideal for younger children. Now Go Play With Your Kids! Charades are a source of great fun for the entire family and there is simply no reason not to adapt the game to kids. Charades ideas for kids of all ages are everywhere around you. Since we are certain that you know what makes your child tick, we imagine that you won’t have any problems coming up with them. If you hit a snag, you can always turn to this generator which includes 100s of ideas there. The important thing to keep in mind is that kids put fun first, so make sure that you deliver on that promise! Have any more ideas to be added, or any feedback and suggestions on this piece? Please get in touch here. We're looking forward to hearing from you.